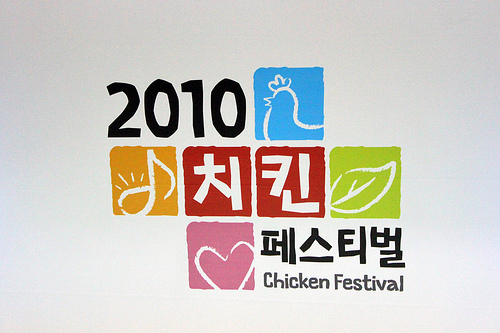 The one festival I had been looking forward to this season had been the first ever Chicken Festival in Korea. At least, it was billed as that. I think it’s safe to say that the two biggest international draws to Korean food lately have been barbecue and fried chicken. We have a ddeok festival and a kimchi festival (yawn). We still don’t have a barbecue festival, but I was hoping this chicken festival would be going in the right direction. Chicken, chicken everywhere, but not a drop of beer to drink! I shoulda known better. It was more of a trade show. A very sad trade show. Only two or three fried chicken restaurants showed at this, and they didn’t supply any alcoholic refreshments, which complete the Korean fried chicken experience. Instead it was a lot of supermarket chicken products festering away in refrigerator cases that obviously weren’t cold enough. I did spend a good bit of time there, hoping something interesting would occur. It was a great place if anyone wanted to do a study on the social tendencies of Koreans and lines. In Seoul, particularly, I have observed that lines are like velcro. If people see a line, be it at a shoe store or an overrated restaurant, they’ll join in. Sometimes, I’d go to a food cart or something that has no people, get something, and find that a line had instantly formed behind me. I have always wondered if they were standing in line for a desired product or just standing in line for the sake of it, not knowing what was in store. In this case, there was a line a half a kilometer long for a paper cup of a few chicken nuggets from BBQ Chicken. I’ve had BBQ Chicken. I know what it tastes like. I like it. But I’m not standing in line thirty minutes for two chicken nuggets–free or not. In fact, the booth across from BBQ started putting fried chicken on its counter, and people looked puzzled. They didn’t see anyone already standing in line for the rival chicken nuggets, so they didn’t know what to do. So, while I was there taking pictures of the line, I reached out with my left hand and got a cup of chicken nuggets. No wait. There was a sign for something called a “Chicken Party” starting in 45 minutes. Three people stood and read the sign. Instantly a line formed behind them. I guess the people in line eventually figured out they were waiting for no reason, and the line disappeared ten minutes later. Other noteworthy bits about the Chicken Festival Trade Show. Turkish kebab joints made a strong showing. Chicken on a stick was not so popular. The coolest thing I found were these finger condoms for eating messy foods–like fried chicken. Of course, there was a big line at the booth, and I just was interested in taking pictures of the product. Then a lady came by and handed me some free samples. So, I know none of the organizers aren’t reading and don’t care. But let me get this out for catharsis. A chicken festival should be a chicken FESTIVAL. I understand that this was planned more as a trade show. But using the word “festival” was a bait-and-switch, not just for me but for the general public. That’s why we had these lines of ordinary Korean consumers there, but the deal making booth for buyers and suppliers was pathetically empty. Next time, guys, really, really, do it! I don’t have many photos, but you can find them on the Flickr account. So, uh… why don’t you hold a chicken festival? I’ve been to several of these “festival” trade shows and expos. You hit the nail on the head in the penultimate paragraph talking about “pesteutibeol.” The hangeulized word isn’t the same as 축제, and you’ll get different results. Seriously, like Frank said, just start your own. No sense in helping other people—for free—start something that could potentially make a lot of money. If you see something that isn’t there, put it there yourself. Hold a fried chicken cook-off, or something. I’ll give you that idea for cheap, provided you DO NOT call it 프아이드 치킨 쿸어프 in Korean.